My goodness, where has this card been all this time? In a world of high profile commodities, the 1952 Mays is certainly on the short list of must-haves; only problem is it's never found with high end eye appeal. Offered here is an altogether stunning and truly immaculate specimen which blows away every other PSA 8 which has sold in over the last decade. Almost dead centered with four strong NM-MT or better corners and surfaces which could only be defined as MINT in our opinion. Completely pack fresh throughout with only the slightest whips of wear at the extreme corner tips downgrading. All told this looks very much like a NM-MT+ card and appears worthy of review. As it sits, this must be one of the top 3-5 PSA 8s in the world and as such represents a tremendous value above the typical market. We love this card for obvious reasons and highly recommend it. Worthy of the finest collection. 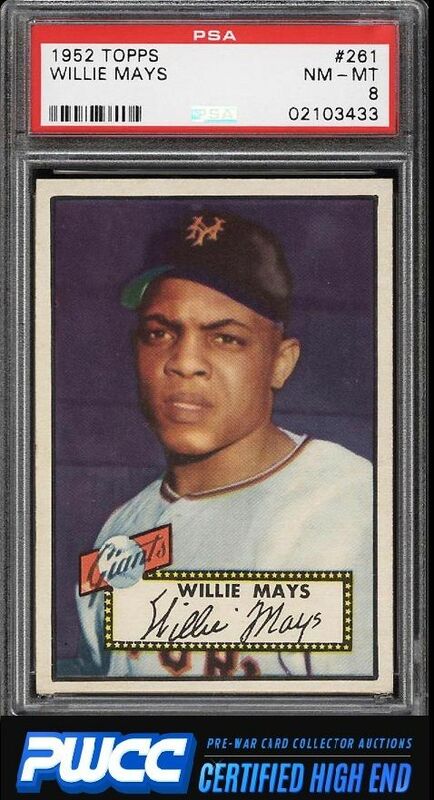 One of nearly 17,000 cards, lots, and sets up for bid in our 8th Auction of 2016. Click on the link above to view the other PWCC auction lots.